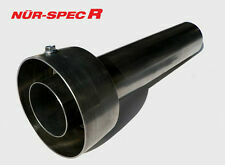 Blitz Nur Spec R baffle for 114.3mm tail pipe. 260mm long. All Blitz Nur Spec back boxes conform to the Japanese JASMA regulations. BLITZ NUR SPEC S EXHAUST. Note: Nur Spec S is not interchangeable with Nur Spec R. You will notice that almost all Blitz products are advertised as having just the one item available. THE BLITZ FRONT SUS 304 STAINLESS STEEL PIPE CONNECTS THE EXHAUST TURBO UP-PIPE THROUGH TO THE CATALYTIC CONVERTER OR DE-CAT PIPE. BLITZ STAINLESS STEEL FRONT PIPE. NISSAN SKYLINE. PART NUMBER: 21556. The quality of the Blitz stainless steel exhausts is second to none. Rated as the highest quality, Blitz exhausts perform as well as they look. Unlike conventional exhaust systems, Blitz exhausts utilize a slanted mounting design which eliminates unnecessary bends. BLITZ NUR SPEC RX EXHAUST SYSTEM. Blitz Nur RX exhausts are designed for maximum performance and amazing appearance whilst maintaining an acceptable Jasma compliant exhaust note. The Nur RX range looks very similar to the Nur Spec R but does not have a removable baffle. TURBO EP82. All Blitz Nur Spec back boxes conform to the Japanese JASMA regulations. BLITZ NUR SPEC S EXHAUST. Note: Nur Spec S is not interchangeable with Nur Spec R. You will notice that almost all Blitz products are advertised as having just the one item available. THE BLITZ FRONT SUS 304 STAINLESS STEEL PIPE CONNECTS THE EXHAUST TURBO UP-PIPE THROUGH TO THE CATALYTIC CONVERTER OR DE-CAT PIPE. BLITZ STAINLESS STEEL FRONT PIPE. You will notice that almost all Blitz products are advertised as having just the one item available. 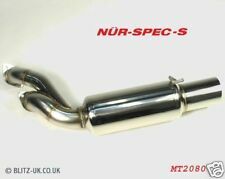 Blitz nur spec r exhaust with decat pipe included. Considered by many to be one of the best exhausts you can buy. Amazing sound. BLITZ STAINLESS STEEL DE-CAT PIPE. exhaust systems and the Blitz Nur-Spec series of exhausts. You will notice that almost all Blitz products are advertised as having just the one item available. We will advise you straight away if the item remains available or not so you can proceed with your order. S14 & S14A. THE BLITZ FRONT SUS 304 STAINLESS STEEL PIPE CONNECTS THE EXHAUST TURBO UP-PIPE THROUGH TO THE CATALYTIC CONVERTER OR DE-CAT PIPE. BLITZ STAINLESS STEEL FRONT PIPE. NISSAN 200SX. Blitz Nur Spec DT exhausts are designed for a luxurious look with the dual tube tip design. The design and construction of the Blitz Nur Spec Double Tube exhaust are second to none. Nur Spec DT, 2 Piece exhaust system.